Description This book is an introduction to the use of additions in clay bodies, from hard materials like stones and glass to combustible matter, fiber, metals and color. It looks at the work of a range of contemporary international makers who are using additions to create remarkable new forms and textures in ceramic work. With an emphasis on creativity and experimentation, ceramicist Kathleen Standen reveals a range of possible effects, and profiles the extraordinary work of contemporary makers using additions in their practice. 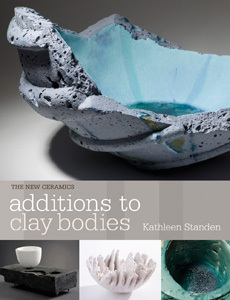 Kathleen begins with an introduction to collecting local clay and making your own clay bodies, then the book moves on to cover the array of additions being used by artists today, from hard materials like stones, glass and rust, to combustible matter and fiber, metals including wire and mesh, and color in various forms. Kathleen wondered what you could add to clay — rice, dog biscuits, coffee beans, cereal grains, nuts, bark chippings, glass beads, pebbles, nails, perlite and bits of broken pots — things lying about the studio. But she wondered what conceivable difference these materials could make if she added them to a clay body? That was the challenge she set out to study and it was a trigger that set her off on a journey, exploring and embracing the difference additions can make to clay making. In this book you’ll learn how to go about finding and digging your own clay, how different materials behave when fired to different temperatures, how to work with colored grogs and recycled glass, what happens when you add granular feldspar or crockery shards to a body, and much more. Beyond the hard materials, Kathleen explores organic combustible materials and the cool surfaces and effects you get from those. Ever wondered what would happen if you added seeds and which ones work better if you toast them? How about rope, cotton balls or yarn? If clay has a unique texture created from an addition, coloring the clay adds a whole new visual quality to it. In a chapter on color, Kathleen describes how many of the artists in the book add color to their clay, as well as a variety of other additions. She includes their descriptions of the procedures they follow and the coloring materials they use. What if you dipped a piece of lace into slip and fired it? What if you added crushed monkey-nut shells to the clay before filling a mold? What if you increased the grog by 25% and then made a form 4 inches thick? What if you inserted metal pins into my thrown form? What if you brushed clay onto fibreglass and then constructed a form of unimaginable thinness? What if you rolled grasses into porcelain paperclay slabs? These opportunities to expand the horizons of clay, and many more, have been tried by successful artists and their experiences are shared with you in this book.